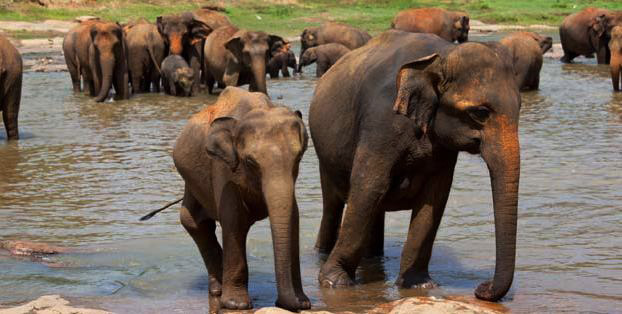 Elephant Endotheliotropic Herpesvirus (EEHV) causes an acute hemorrhagic disease with 80% fatality rate amongst Asian elephant calves and is a major threat to the breeding success and long-term survival of Asian elephants worldwide. The seven known major types of EEHV are evidently harbored as ubiquitous in apparent infections in all populations of Asian or African elephants, but for as yet unknown reasons, they can have devastating effects as primary infections in up to 20% of young Asian elephant calves worldwide. DNA diagnostic tests specific for all the different types of EEHV have been established that allow monitoring of infection episodes in individual elephants. To try to understand the nature and biology of these multiple EEHV types, researchers at the Johns Hopkins University School of Medicine have been successfully carrying out DNA sequence analysis directly from pathological blood, tissue or biopsy samples from all available cases of systemic disease, as well as from occasional localized reactivating latent virus. Almost everything now known about the origins, epidemiology, evolution and protein coding content of the EEHVs has come from the results of these genetic sequencing studies, which include the complete 180,000 nucleotide genomes of EEHV1A and EEHV1B. Recent technical advances now offer an important and unexpected opportunity to substantially increase the level of comparative information about the genomes of EEHV2, EEHV3, EEHV4, EEHV5 and EEHV6 from pathological tissue of cases of infection.